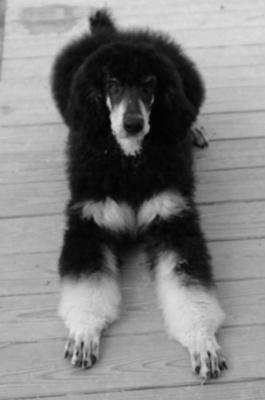 We love and raise the phantom Standard Poodles. They are so intelligent and always in the mood for some play time. This is Kingston, one of our last litter, who is going to go live with Illena in TN. He is very smart, loves to play chase and will prance through the yard with such style and grace. He's a very proud boy. This is a photo of him when he is inviting us to play with him. It's ready, set and go. We hope to improve on the markings with every litter we raise but he is so very handsome and I don't think I could ask for much more.